One of the main drawbacks of the ToF cameras is their low resolution. 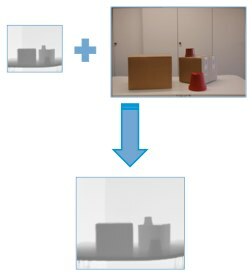 For this reason, in  and  we proposed a super resolution method of depth maps with side information given by a standard high resolution camera. -------- "A Novel Interpolation Scheme for Range Data with Side Information"
For all the IEEE Publications: (c) 2008 IEEE. Personal use of this material is permitted. However, permission to reprint/republish this material for advertising or promotional purposes or for creating new collective works for resale or redistribution to servers or lists, or to reuse any copyrighted component of this work in other works must be obtained from the IEEE.